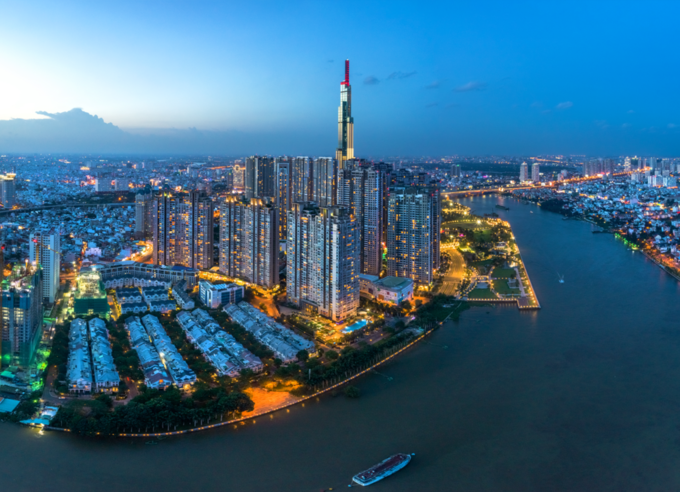 Hanoi and HCMC will continue to be among the best performing office space markets globally in 2019, top property consultants have predicted. Troy Griffiths, deputy managing director of real estate service firm Savills, told VnExpress International it was the case last year and this would continue on the back of very strong demand amidst supply constraints. "The demand driver is very strong, especially that from the booming financial services sectors like insurance and banking." He said rentals would rise across the board as a consequence. "The Hanoi market’s rental might grow somewhere between 7 to 15 percent across all grades this year, while it will probably be slightly lower in HCMC, at 11 percent for A grade. "Rental will continue to trend up until supply catches up. Occupancy will be very strong at 90 percent and above. This will be much a story for 2019." Official statistics show that at more than $19 billion, foreign direct investment (FDI) disbursement for 2018 in Vietnam was the highest in a decade. The country's commitment in free trade agreements (FTAs) including the Comprehensive and Progressive Agreement for Trans-Pacific Partnership (CPTPP), which came into force on January 14, 2019, is also expected to boost economic prospects, resulting in a positive demand in office market. Dung Duong, head of valuation, research and consulting at CBRE, also said Hanoi and HCMC will continue to be two of the world's best performing office space markets this year. "Grade A average asking rent in HCMC is expected to increase by 4 percent in 2019, while occupancy will reach as high as 96 percent." In Hanoi market, positive rental growth is expected in both grade A and B, especially in grade A on the back of new quality supply in the central business districts (CBD) in 2019, she said. "This will become the newest grade A supply after three years of no new supply. In terms of demand, apart from traditional sectors such as banking, insurance, manufacturing and IT, co-working space is expected to continue to be a major source of demand." According to a recent report by another real estate services provider, JLL, the HCMC market added 60,269 square meters of new supply from two grade B and four grade C buildings in 2018, taking the total inventory to nearly 1.97 million sq.m. The robust demand had pushed the occupancy rate to more than 96 percent by the end of last year, the report said. "Technology, IT companies and flexible space operators continued to show signs of expansion, while tenants in services, finance and manufacturing continued to dominate leasing demand in the market." Average rent was $23.6 per square meter per month, up 4 percent from the previous year. There was no new grade A supply last year and only one new grade A building will be added this year, the Lim Tower 3 in Nguyen Dinh Chieu Street, District 1. In Hanoi, given the buoyant Grade A demand and limited premium supply, some buildings in the CBD with high occupancy rates continued to increase rents in the fourth quarter of 2018. Thai Square fronting two streets in the capital’s Hoan Kiem District, Tong Dan and Tran Quang Khai, is expected to come into the market in the first quarter of 2019, adding more than 25,000 sq.m to the inventory. By the end of 2019 some 153,000 sq.m of space is expected to be added in Hanoi, the report said. While the opportunities in office investment in the HCMC and Hanoi CBDs are obvious, Griffiths said foreign investors interested in them would find a lot of challenges. "The reality is that land in CBDs in HCMC and Hanoi have a great deal of domestic ownership." He advised foreign investors to seek good long-term joint venture partnerships. "There are more and more domestic real estate companies listed on local bourses and they are very active in the property market. That gives an opportunity for greater liquidity and great foreign ownership. I think it’s pretty essential for foreign investors to have good joint venture partnerships with such firms."